 Travel Indiana’s Historic Pathways, US 50/150, through the counties of Jackson, Lawrence, and Martin for some outdoor recreational fun. 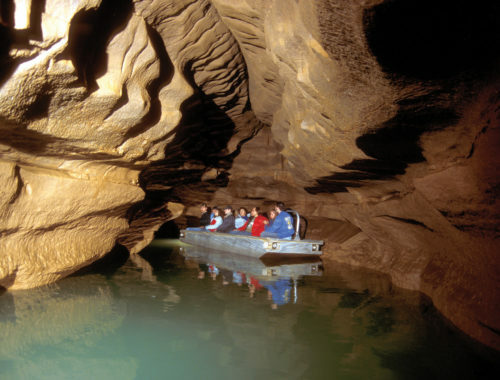 Each county offers its own unique way to explore the ruggedness of the land without going far from civilization. 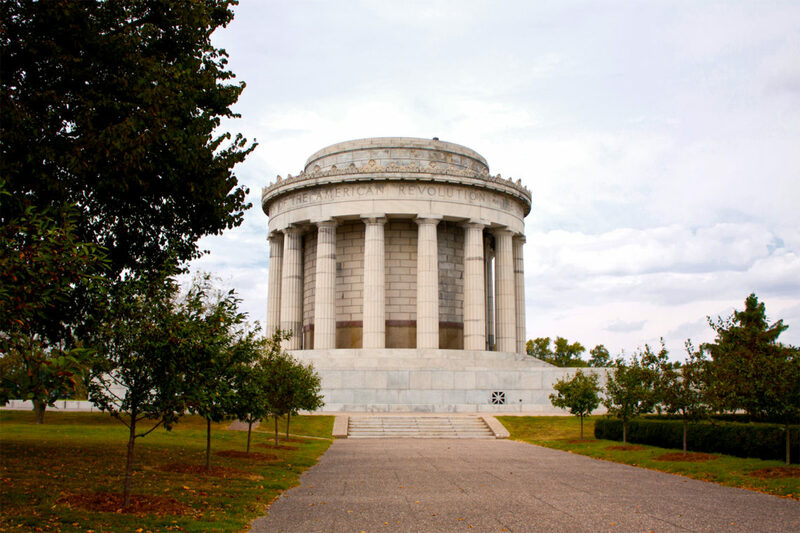 Begin your experience of the byway at the very place where early pioneers would have disembarked from a boat on their journey from the Ohio River into the Indiana Territories. 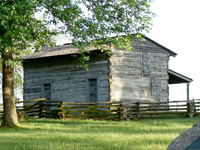 Part of the Falls of the Ohio State Park, the George Rogers Clark Cabin Homesite is well-marked and just west of the interpretive center on a high bluff. Once you’ve explored the cabin homesite, go back past the Falls of the Ohio State Park and take W. Riverside Drive toward West Winbourne Avenue. Turn left onto Southern Indiana Avenue. Turn right onto West Market Street and continue to 1101 E. Market St.
At the Howard Steamboat Museum, you’ll learn all about the Howard family, who built the steamboats in the late 1800s that plied the Ohio River. This home-turned-museum was built by those same craftsmen that worked in their shipyards. As you peruse the exquisite 22-room, late-Victorian mansion, gain an appreciation and an understanding of the steamboat industry through the artifacts and models of famous boats built in the Howard Shipyards. Go southwest on Market Street then turn right on Penn Street. Turn left onto East 10th Street/Old Indiana 62. Go 0.7 miles before taking the US-31ramp toward New Albany. Turn slightly right ontoUS-31. Follow the ramp toward New Albany/Browns Station Way. Merge onto Browns Station Way/Old IN62-W which becomes East Spring Street. Turn left onto Vincennes Street or Indiana 111. Turn right onto East Main Street to reach the Culbertson Mansion. 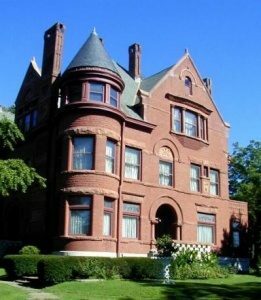 Get your first taste of New Albany with this Victorian mansion William Culbertson built in 1867. 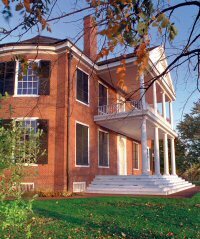 As you explore his home, you’ll discover his prosperous history, which began when he settled in New Albany at the age of 21. The young Culbertson found employment as a clerk in a dry goods store. He possessed exceptional business sense and energy, and by 1860, he had become a prosperous, independent businessman. In 1868, Culbertson retired from the dry goods business to invest his money in new ventures, including managing stock in the Kentucky-Indiana Railroad Bridge Company and establishing his own utility in 1854. He was known as a philanthropist and at his death in 1892, he had achieved a net worth of 3.5 million dollars (approximately $61 million in today’s economy). 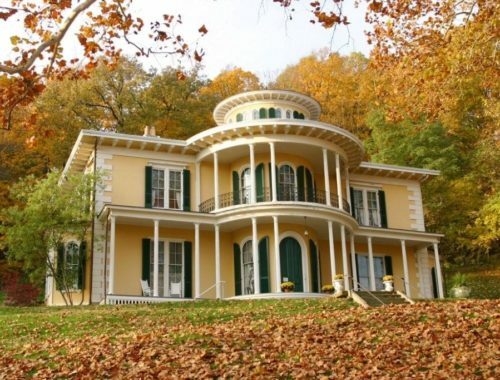 Culbertson’s story fits into Indiana’s Historic Pathways because of his tie to the early railroads and transportation industry as well as the unique architecture and beauty of his historic home, which is just off the byway. From Culbertson Mansion go southwest on East Main then right on State Street. Turn left onto West Spring Street. Merge onto I-64/US-150. Within 3.7miles, US-150 veers off and heads north. 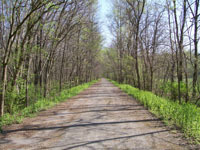 Follow this well-signed route toward Paoli, 55 miles from New Albany, and you’ll pass through the Pioneer Mothers Forest on the way. Follow the byway (US 150) into town and around the courthouse. Instead of following US 150west toward Shoals, continue around the courthouse and turn south on Gospel Street. Drive across the iron bridge, which is just one block off the courthouse square. You can then turn around, drive back across the bridge, around the courthouse square again, and get back on US 150. As you cruise around the town, also notice the murals and interesting architecture. Paoli was settled by Quakers and you’ll discover through the Quaker meeting houses along the way that this denomination still plays an important role in the community. Continue on US 150 out of Paoli. At the junction of US 150 and SR 56, turn left and go about a mile into the town of West Baden. The West Badenand French Lick communities are adjacent to each other. Both hotels are on the main street and are very easy to find. Although French Lick and West Baden Springs require a short jog off the byway, these two adjacent communities are well worth the detour. Stay overnight at one of the historical hotels, and learn something of their past while you’re at it. From the byway, take the US 41 exit in Vincennes. 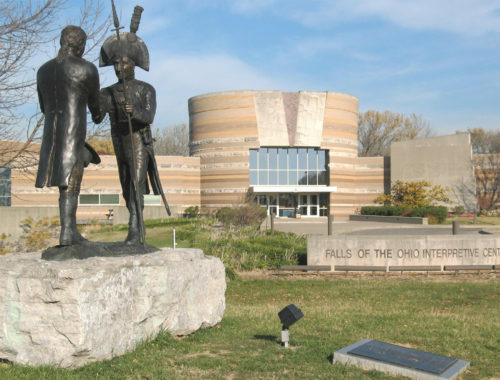 Follow the signs to George Rogers Clark National Historical Park. It is approximately one mile off the highway in downtown Vincennes, and it is located at 401 South 2nd St.
Take 2nd Street northeast. It will become Patrick Henry Drive. Turn right onto South 1stStreet and proceed 0.5 mile. Turn left onto East Scott Street. 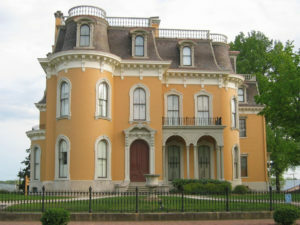 The Vincennes State Historic Site is adjacent to Grouseland. 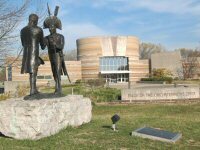 Come to Vincennes State Historic site and you’ll stand at the same place Tecumseh once stopped, where troops mustered courage for the battle of Tippecanoe, where laws were passed that still affect Indiana residents today, and where the first free press in Indiana was born. 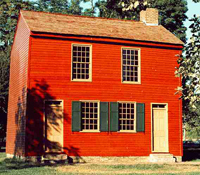 Drive by, or pull over and walk past the “Red House” and the many historic buildings nearby. Immediately next to the “Red House,” check out the Elihu Stout Print shop, which started printing weekly newspapers in 1804, or admire the architecture of the Old State Bank to wrap up your byway experience.